Cardiopulmonary resuscitation (CPR) is an emergency combination akin to making available an artificial heart and lungs to a person so desperately in need of them that he or she may lose their life for want of it. CPR comprises of techniques designed to be carried out by a person without any healthcare background as you never know when you may be called upon to save a life. The aim of CPR is to prevent irreversible damage to the brain as a result of stoppage of blood pumping action from the heart. Just imagine, how useful this simple knowledge can be as accidents and situations like those listed above are everyday occurrences and one might come across a situation of this nature during the course of life. C stands for Circulation (or chest compressions). The following description is suitable for CPR performed on an adult. First of all, make sure that the person receiving CPR is conscious. To check the status, shake the person (not recommended if choking is suspected especially in children) and look for a response or ask a question. If there is a response, proceed with CPR. If there is no response, and you are not alone, then ask your companion to arrange for assistance from emergency services like hospital, police, or fire services. Their numbers should be on your tips. If you are alone, then inform the emergency services first and proceed on to CPR. Chest compressions work the same way as an artificial heart for a critical person. To proceed with chest compressions, first of all position the person on a flat surface, stand close to the side of the subject’s neck and bend down, place one palm over the centre of the person’s chest (the middle of chest where you feel a slightly depressed surface), keep your arms straight without bending at the elbows and push the chest downwards by at least 5 centimeters using your own weight. Continue chest compressions at a rate of about 100 times per minute. The second step is clearing the airway to allow for the exchange of air by lungs. Clear the airway after giving about 30 compressions. This is done by tilting head of the person backward followed by lowering the chin. If the person has had a head injury, then the head should not be tilted back and also one should not force open the jaws to clear the airway. Check whether the person is breathing by placing your fingers under the person’s nostrils and feeling for the movement of air, or by noting breath sounds. Please note that gasping is not considered to be normal breathing. If the subject is not breathing, provide mouth to mouth breathing. The breathing can be given either mouth to mouth, or mouth to the nose (if mouth cannot be opened due to injury or any other reason). If you do not know the technique for the mouth to mouth breathing, then this step may be skipped while chest compressions should continue till help arrives. Breathing is given in cycles wherein each cycle comprises of 30 chest compressions followed by two rescue breaths. The first cycle should begin immediately after ensuring patency of the airway. For mouth to mouth breathing, pinch the nostrils (to prevent air from escaping), put your lips on the lips of the person to seal the opening, and blow into the mouth of the subject. Watch to see whether the chest rises or not. If the chest rises, give another breath. If the chest does not rise, again ensure the patency of airway; give a second breath followed by 30 chest compressions. You should keep one hand on the chest when you release the pressure of the palm (otherwise you have to locate the right placement position every time you compress the chest). Provide further chest compressions and breath cycles till at least five cycles have been given. It takes about two minutes to complete five cycles. Continue the process until the person revives or until help arrives. Your readiness to provide CPR can be of two types. Either you are well trained and confident or you are not. In case you are confident that you can handle the emergency, then follow the steps listed as under. For a trained CPR provider - start with 30 chest compressions and also give rescue breathing. For an untrained CPR provider - provide continuous chest compressions at a rate of about 100 per minute but without providing rescue breathing. The procedure for giving CPR to children aged one to eight years is same as that for adults except the following differences. If you have no one to help you, then first give 5 cycles of compressions and breaths and then inform emergency services. Use single hand for chest compressions. Preferably use pediatric pads or otherwise use adult pads for compressions. First of all, ensure that the airway is not choked. If it is choked, then give first aid for choking, otherwise proceed to CPR. All other steps of CPR are the same as for older children. Never shake a baby as it may lead to further choking. Anybody can give CPR. You can give chest compressions even if you are not trained in full CPR. Feel for your own chest bone which is a slightly depressed flat surface in the center of the chest. That way, you will be better able to locate the same on the chest of another. The telephone numbers of emergency services should always be on your tips wherever you might be. If it is not possible to memorize them, then please store them on your mobile phone or pocket diary. Never hesitate to seek help, whatever the source may be. 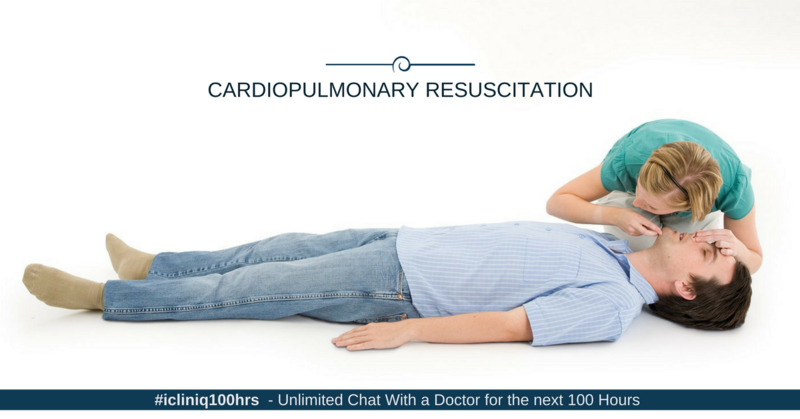 Do you have a question on Cardiopulmonary Resuscitation or Cpr?